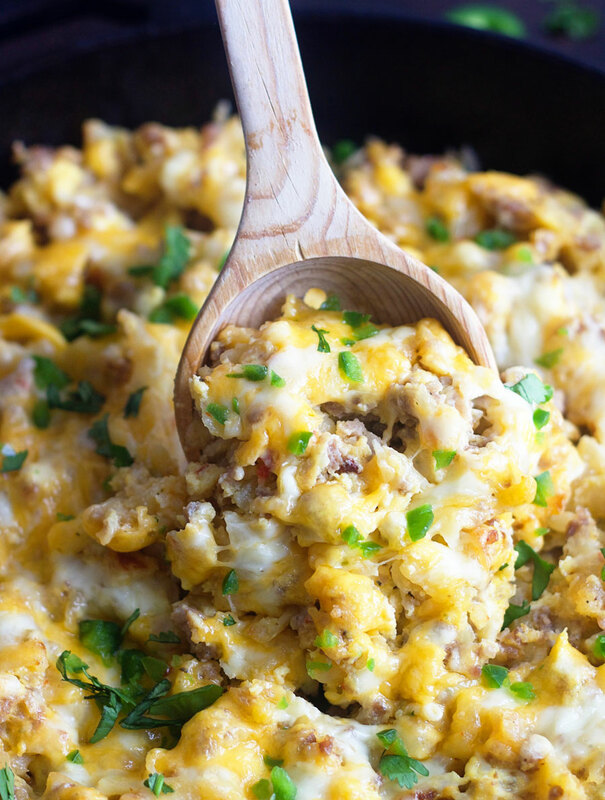 This Breakfast Burrito Skillet Meal is all the yumminess of breakfast burritos without the tortilla. It’s hearty, filling, so simple to make and crazy delicious! We are a breakfast food loving household and we absolutely love breakfast for dinner. Waffles, french toast, breakfast burritos, pancakes, scrambled eggs, etc. We love it all! 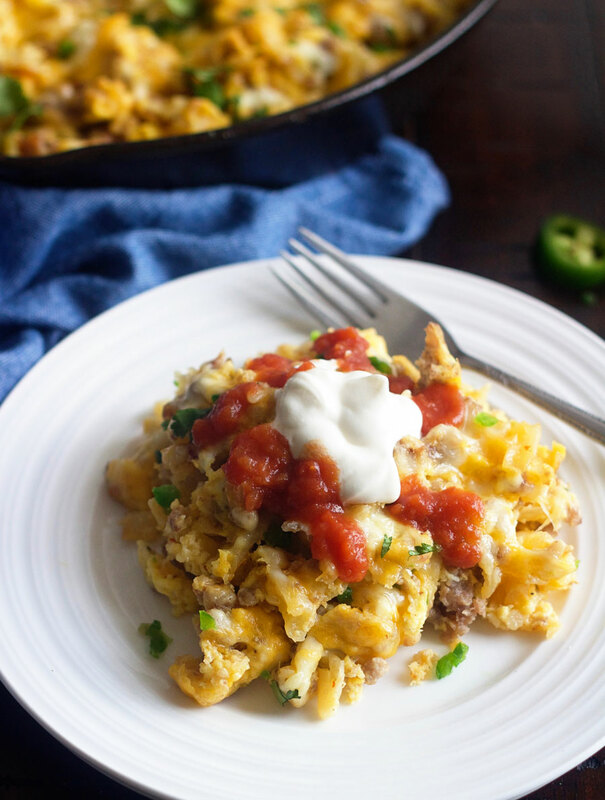 This Breakfast Burrito Skillet Meal is currently at the top of our favorites list and so far, I’ve only made it for dinner. It isn’t fancy and definitely doesn’t fall into the “gourmet meal” category, but it’s seriously delicious and my kind of comfort food. We all know how much I love skillet meals because of their simplicity. 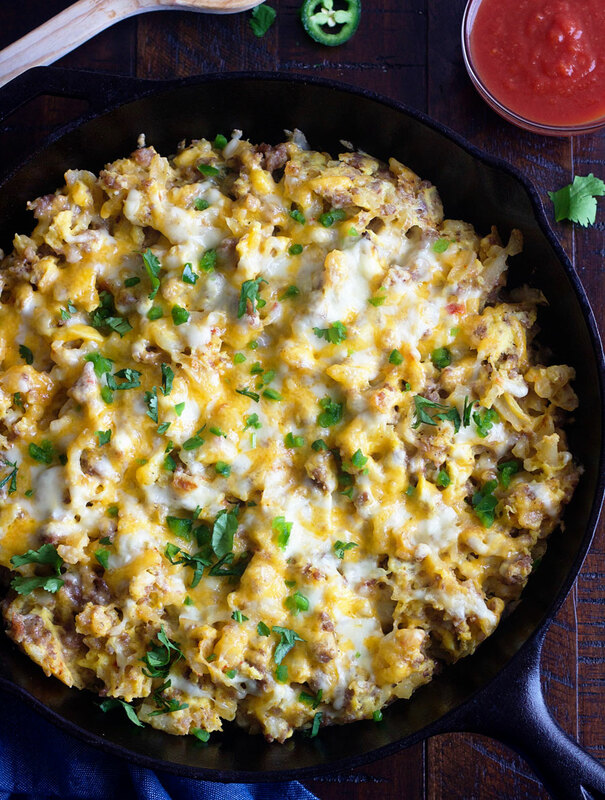 This breakfast burrito skillet is so easy to make. The list of ingredients is simple, uncomplicated and the end result is a powerhouse of a meal. It’s filling, satisfying and you’ll find yourself wanting another scoop and then another and another. The smart ones in this family topped ours with sour cream, salsa and avocado, while the boring, not-so-smart ones ate theirs plain. . . to each his own I guess. One of the things that makes this skillet meal so good is the southwest style hash browns. I use the Simply Potatoes brand. The southwest style hash browns are kicked up a notch with onion, green, red and jalapeño peppers already added in. If you can’t find the southwest style, then you can sauté your own onions, peppers and jalapeños in some butter before adding in the hash browns. I get zero complaints around here when I make breakfast burritos in any form and no complaining is music to my ears. Serve this with some fresh fruit and you have a seriously good meal! In a medium bowl, whisk together the eggs, half-and-half, salt, pepper, red pepper flakes and 1 cup of the cheese. Set aside. In a large oven safe skillet, brown breakfast sausage over medium heat. Cook until no longer pink and then scoop onto a paper towel-lined plate and return skillet to stovetop. Add butter to skillet and melt. Add hashbrowns to skillet and cook over medium high heat until golden and slightly crispy on edges. 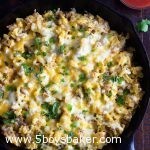 Reduce heat to medium and add the cooked sausage and eggs into the skillet with the hashbrowns. With a spatula or large wooden spoon, gently stir occasionally until eggs are set. Sprinkle with remaining cheese and put in oven and cook for 10 minutes or until cheese is melted and bubbling.